Kimberly Clavin, VP of engineering at Pillar Technology Group LLC, guides students at the Delaware Area Career Center through a tour of Pillar’s office in Columbus. Clavin used a robot with a camera and video conference equipment to show students the office environment and allow them to ask staff members questions. On Monday, Pillar Technology Group LLC VP of Engineering Kimberly Clavin gave a presentation about the company to digital design, app development, and engineering students at the Delaware Area Career Center. 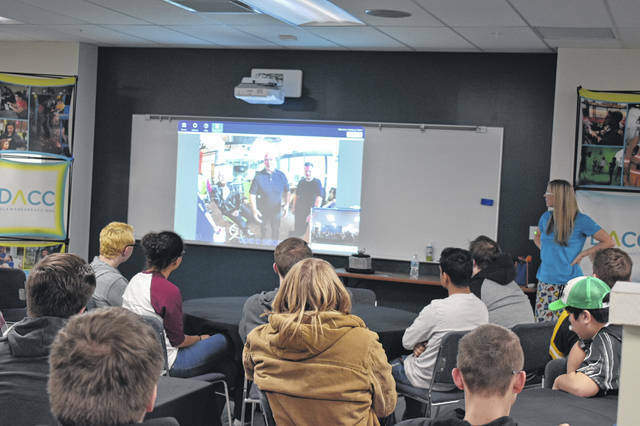 Meanwhile, more than 20 miles south, a robot-mounted camera controlled by Clavin guided the students through a tour of the office, stopping periodically to ask questions of various employees. Clavin gave the presentation and tour to juniors and seniors at the DACC, and she added she wanted the students at the presentation to gain awareness of all the career paths available to them in the STEAM (science, technology, engineering, art and mathematics) field. Clavin added the open-ended style of the presentation and tour gets students more engaged, since they can ask questions of virtually anyone. “It’s hard to read kids, but I gotta say they do seem more engaged than when I gave lectures at the university,” Clavin said. After the presentation, engineering student Scott Huffman said he enjoyed the variety of staff members employed at Pillar. “There were people with philosophy backgrounds and art backgrounds, but they offer that eight-week boot camp, and apparently, you can learn a lot in those eight weeks,” Huffman said. Huffman, a Buckeye Valley senior, said he’s planning on minoring in engineering at Cleveland State University, and he thinks Pillar could be a place he applies to one day based on the tour. Veronica Leist, a senior in the app development program, said she enjoyed seeing the open, collaborative spaces at Pillar during the virtual tour, and while she’s planning for a career in game design, she thinks the tour probably benefited her classmates. “It’s not my thing, but it’s probably a fit for other people,” said Leist, a Buckeye Valley student. Digital design senior Chris Skomra said he thought the presentation was good and relatable to students. “She was definitely speaking everyone’s language,” Skomra said. Skomra added the digital presentation saves the school money, but it still gives students the experience of a tour. Skomra added he enjoys a more structured environment, and he is planning on studying music production at Full Sail University.